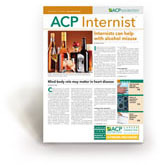 Published 10 times per year, the print edition of ACP Internist is available as a free subscription for ACP Members only. Available to the public, the online edition of ACP Internist includes additional features like newsletter and blog posts. 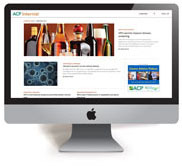 Receive the latest from ACP directly to your email inbox. is an e-newsletter that covers the latest news in internal medicine, delivering a summary of the week's most compelling news stories directly to your inbox each Tuesday. is an e-newsletter that focuses on news specific to hospital medicine, delivered directly to your inbox each Wednesday. helps keep you up to date on the diabetes literature, providing a summary of relevant diabetes news each month. helps keep you up to date on the gastroenterology and hepatology literature, providing a summary of relevant news each month. To begin receiving clinical e-newsletters, fill out the form below. Your subscription will begin with the next available issues. * Please describe your primary practice area.